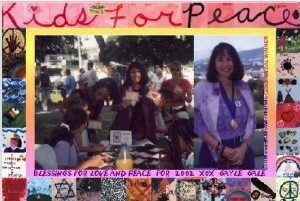 Kids for Peace is an international, community-based mosaic mural founded and led by artist Gayle Gale, promoting Peace and Unity through the creative process in educational mural workshops. This project is an effort to develop the important threads of inter -group cooperation that is essential for peace and co-existence between Israel and its neighbors. Gayle Gale brings to this project her experience in coordinating and directing international large scale community based art activities. Leslie Goldman is your common ordinary every day Enchanted Gardener, serving the seed dreams of 144. He is the author of an endless array of ideas, projects and creations to inspire a healthy earth named the Enchanted Garden. Leslie is also co-creator of the Enchanted Garden Intentional Community in San Diego. The home he shares with others is a plant sanctuary offering nature studies. He was given a UN Peace Medal for his Johnny Appleseed-like ministry that aims to inspire more green thumbs. Leslie teaches that we can be on the web, and still have the web of life as our foundation. For more information about Leslie and his work, please explore his web sites. Plant Your Dream blogger and ceremonialist Leslie Goldman “Your Enchanted Gardener” is known for his inspired poetry and photography, and for his ability to ground intentions with heirloom seeds. For many years, he has been a voice for returning our beat to nature at our services and through his work with the children. Today for many of us, our deepest dreams live in boxes. We are the equivalent of a piece of pizza in a box, feeding appetites with food and buying into a system that has no foundation in nature and little technology that can compare to nature’s original technology. 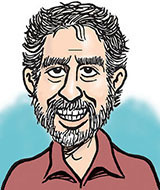 Steve Greenberg is an editorial cartoonist, illustrator and graphic artist. He is perhaps best known for his weekly cartoons in the Jewish Journal of Greater Los Angeles, as well as for the alt-weekly Ventura County Reporter in Ventura, LAObserved.comand many other print and online outlets. His cartoons have won awards virtually every year of his career, including numerous national and regional awards as well as dominating the cartooning category in the Rockower Awards for Jewish journalism. He has also won awards for informational graphics and has been on the staffs of such newspapers as the San Francisco Chronicle, San Francisco Examiner, Seattle Post-Intelligencer and the Daily News of Los Angeles. Steve has dabbled in Judaica design, has been involved in Jewish Renewal since the mid-1990s and been coming to B’nai Horin since 2002. 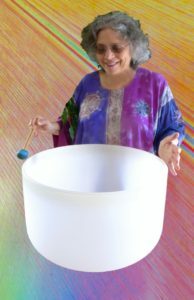 Joy Krauthammer, MBA, a spiritual Jewish woman, serves G*d in Joy, as a purple-loving visual Artist of Light, photographer, nature photo walk guide, passionate performing percussionist, sound healer, poet, educator and gardener, as she reveals the Face of the Divine. 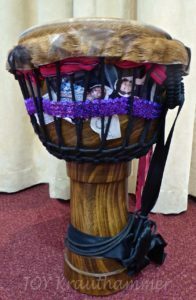 Since 1990 at B’NAI HORIN, Joy has served as a photographer (and percussionist). By Hashgacha Pratit, Divine Providence, she discovered Rabbi Stan Levy and his congregation during a Shabbaton hosting Jerusalem’s Rabbi David Zeller, z”l. Both rabbis immediately became her rebbes, as did Reb Zalman Schachter-Shalomi, z”l, Renewal’s founder, whom she also met at Rabbi Stan’s home. Judaism and Joy’s art are connected through her neshama, soul with her love of G*d, Torah, and creativity. Her kavanot, intentions of art are to uplift, inspire, and to be authentic, truthful, and joyous with conscious connection of wholeness, healing and Oneness, expressed in Four Worlds of Spirit, Mind, Heart and Body. Photos and videos by Joy fill her 80+ websites, are published in books, magazines, and on-line, and adorn spiritual and government websites and illustrate others’ videos. 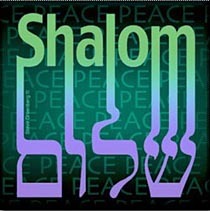 Revealing the Holy One, Joy has exhibited her photos at the Los Angeles Jewish Federation, Exodus Festival, Brandeis-Bardin, Mount Sinai Cemetery, American Jewish University, and at Creative Soul Gallery, New York. Weekly on-line, Joy shares her images in 52 Frames, Image Poetry Group, Caffeinated Photographers and daily in FaceBook. Since the 1960’s Joy has taught children and adults in New York and Los Angeles art schools. She studied art at the Prado, Madrid, and did her graduate work at the Brooklyn Museum School of Art. Joy’s MBA thesis was “Stategic Plan to Preserve and Energize the ARTS”. Following in the footsteps of her artistic ancestors, since a child, Joy has used a camera for joyous and personal expression, and she loves teaching photography. 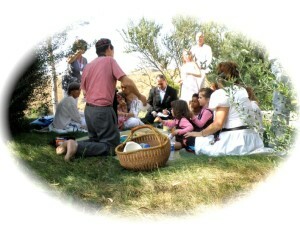 Joy’s photos are found throughout the B’nai Horin website. Photography (along with clay, fiber, drums, digital art and more mediums) is a language of her soul that expresses meaning and ineffable joy. Eva Nathanson, MBA, was born during the Holocaust in Budapest, Hungary and came to the US as a teenager. She earned her MBA at Antioch University. While her professional carrier was in Medical Management she studied art at UCLA and with several Master Craft persons in the Los Angeles area. She had studied painting, sculpting, ceramics, silversmithing and jewelry creation. 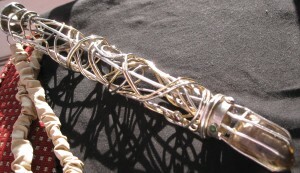 The past 25 years she has concentrated on designing and creating one of kind silver jewelry, ceremonial and gift items. Upon meeting Stan Levy in 1987 she immediately became B’nai Horin’s event coordinator and was inspired to create Jewish art pieces as well. Since she feels that the best artist is nature, she utilizes organic material and nature for her creations. Since retiring from medical management, she continues to pursue her art career, her work as event coordinator, and being an art workshop instructor. She is also a proud mother and grandmother. The Yad for our Holocaust Torah, created by Eva Nathanson.